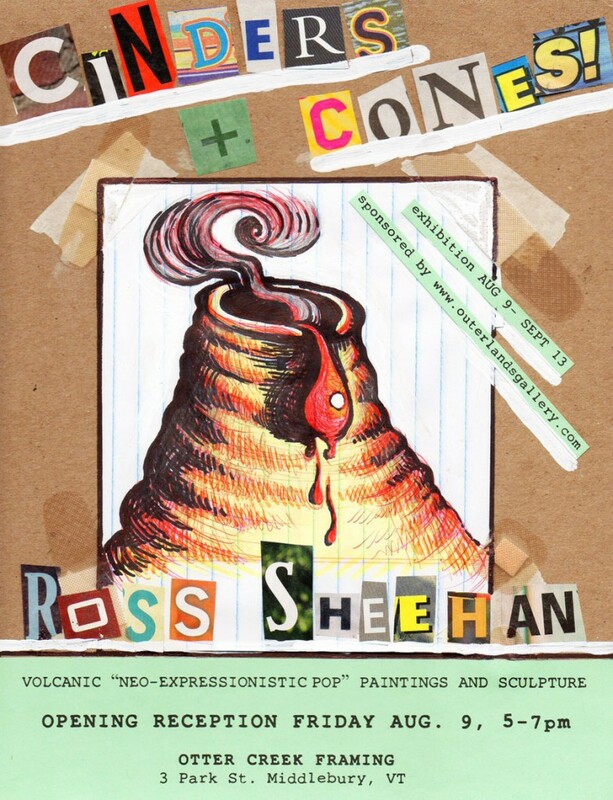 “CINDERS AND CONES”: A new body of “Neo Expressionistic Pop” paintings and sculptures by Vergennes Artist and Outerlands Gallery owner Ross Sheehan. An examination of playful, yet looming, past and present Volcanic forms and activities. “CINDERS AND CONES” runs August 9th-Sept 13th. We hope to see you all there! This entry was posted in Blog and tagged Abstract Art, Abstract Artist, Abstract Artist Vermont, Art, Best Artist VT, Contemporary Art, Contemporary Artist, Middlebury, Middlebury Arts Walk, Otter Creek Framing, Outerlands Gallery, Pop Art, Ross Sheehan, Vermont, Vermont Art, Vermont Artist, Volcanoes.